Clara Mayfield knows that helping her sister Lucy elope with the man she loves, an ambitious, young tradesman, will put her own social standing at risk, but the cost proves more than she expected, more than she is prepared to pay. When even the Mayfield banking fortune proves insufficient to balance out the scandal, her parents, determined to see at least one daughter marry within their social class, accept the offer of a lecherous, corrupt baron for Clara’s hand. Clara, repulsed and frightened by the man, becomes a runaway bride. Disguised in her maid’s clothes, she leaves home with directions to the estate where her maid’s sister works, Lawton Park in Kent. For eighteen months, William, Lord Ashworth, has remained at his home in Kent recovering from the wounds, physical and emotional, that he received in a carriage accident in which his father, his elder brother, and his sister’s husband perished. He has come to London to reenter society by attending a ball, but at the last minute, he cannot bring himself to reenter a social scene where the new Earl of Ashworth will be the cynosure of the ton eager to see how he is reacting to his grief and his new title. William is tormented by nightmares of the horrific event and by flashbacks that leave him shaken. He refuses to risk the gossips seeing him in that condition, and so he retreats to his country estate. Clara has chosen Lord Ashworth’s home as the place where she will seek employment for two reasons. 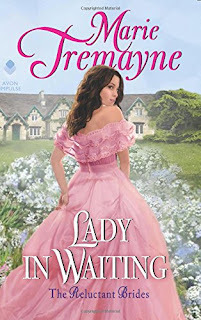 Her maid’s sister will vouch for her as a deserving candidate to fill the position of housemaid, and Ashworth has the reputation of being reclusive, so she is unlikely to encounter anyone who knows her as Clara Mayfield. But it is not easy to lose her identity and become Helen the maid. The work is hard, she misses her family, and some of the servants are unfriendly. Then there is her awareness of Lord Ashworth and her thoughts about what her life might have been like had she met him as Clara Mayfield. William consents reluctantly to hiring the new maid. He is uncomfortable with his inappropriate but irresistible attraction to her, but it only seems to intensify as he sees more of her. When William’s young niece Rosa joins his household and quickly develops a fondness for “Helen,” Clara becomes even more intimately involved with the family. It is clear that both Clara and William have fallen heart over head, but only the revelation of Clara’s identity can make a relationship between them possible. Will William be able to forgive her deception? Lady in Waiting, the first book in the Reluctant Brides series, is Marie Tremayne’s debut novel. The book suffers a bit from the dreaded sagging middle, but overall, it is a strong first book. Clara and William are both sympathetic characters. I especially appreciated that Clara is not a passive, poor-me heroine but rather one who acts to save herself from the baron’s literal and figurative clutches. William is not a cliché-ridden brooding hero, but a man dealing with physical and emotional trauma and surviving as he can. The secondary characters, upstairs and downstairs, have an attractive vitality. Rosa is a darling, and her widowed mother, William’s sister Eliza, and William’s friend, Viscount Evanston, are an appealing pair who will leave readers hungry for their story. Marie Tremayne is an author to watch. If you like historical romance that moves beyond London’s social scene and narrow society, I think you will enjoy this book. If you, like me, are hooked on Eliza and Evanston’s relationship, you will be pleased to know that their story, The Viscount Can Wait, will be released August 14. Sounds very good - thanks!! I've had this on my radar for awhile now and look forward to reading it. Thanks for sharing Janga's review. Marie is a new Author to me. This sounds like a good read. She's a new author to me but sounds like something I'd like. New author to me but it sure sounds good. Thanks for the review.